Berkeley, CA: Self-published, 2001. Original wraps. Very Good +. Ann Arnold. 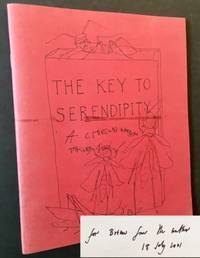 Charming guide by renowned Bay Area bookseller and collector Ian Jackson (with an assist from his son Arnold and illustrations by his wife Ann) on the dos and don'ts of taking on legendary (and legendarily prickly) bookseller Peter Howard and his formidable Serendipity Books of Berkeley, CA. Here we have the first 2 of 3 volumes issued. Vol. One ("How to Buy Books from Peter B. Howard") is the February 2001 2nd edition and Vol. Two ("How to Buy Books in Spite of Peter B. Howard") is the 2000 1st edition. Both volumes, in their pictorial wrappers, are crisp and VG+. Both have one very thin band of gum residue from where a rubber band had been pressed against them for a long time but, otherwise, are near-pristine. Octavos, VOL. ONE INSCRIBED BY AUTHOR IAN JACKSON at the front free endpaper. Oxford University Press (Clarendon Press), 1924. A solid, well-preserved copy of Vol. VI (Accessions 1890-1915) of a Summary Catalogue of Western Manuscripts in the Bodleian Library at Oxford. Tight and Near Fine in its navy-blue cloth, with bright gilt-titling along the spine. Internally very clean, with no wiriting or markings to speak of. Thick octavo, 498 pgs. New York: The Macmillan Company, 1924. Cloth. Near Fine/Very Good. 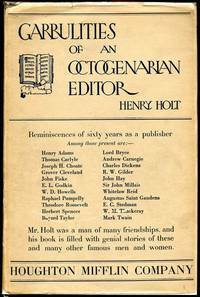 The February 1924 2nd printing, in its uncommon dustjacket. Clean and Near Fine in a crisp, price-intact ($2.50), VG dustjacket, with light creasing --and several very small closed tears-- along the panel edges. Light soiling as well to the rear panel. Octavo, 213 pgs., generously illustrated thruout. New York: American Sunbeam Publisher, 1997. Original wraps. Very Good. 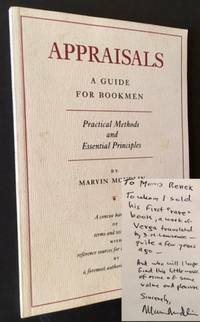 WARM, HALF-PAGE INSCRIPTION FROM THE AUTHOR MARVIN MONDLIN on the half-title. A tight copy to boot of the 1997 1st edition. Solid and VG in its beige wrappers, with light spotting at the front and rear panels. Octavo, 2,100 copies issued. London: Faber and Faber, 1952. Cloth. Fine/Very Good +. A solid copy of the 1952 "new edition", revised and enlarged by A.F. Johnson. Clean and Fine in a crisp, price-clipped, VG+ dustjacket, with very light soiling at the panels and mild darkening along the spine. Quarto, fold-out frontispiece, 379 pgs. plus Index. London and New York: The Studio Publications, 1956. Cloth. Near Fine/Near Fine. A very solid copy of the 1956 1st edition. Tight and Near Fine in a crisp, Near Fine dustjacket, with just a bit of light soiling along the rear panel. Thin octavo, part of Studio's wonderful "How to Do It" series. Flatbush, Long Island: Privately Printed, 1892. 1/4 leather. Near Fine. A tight, near-pristine copy of the 1892 2nd edition. #177 OF 250 COPIES SIGNED BY THE PRINTER THEO. L. DE VINNE at the limitation. Solid and Near Fine in its later marbled, morocco-backed boards and new endsheets. 5 raised bands and bright gilt-lettering and blindstamped devices at the compartments. Thick quarto, deckled fore and bottom-edges. Uncut and unopened, original wrappers bound-in. A sound, fresh copy. Whittier, CA: The Curt Zoller Press, 1980. Cloth. Fine. Herschel C. Logan. 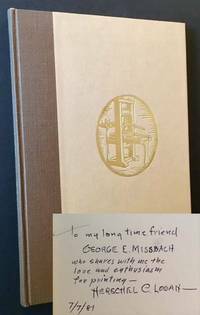 WARMLY INSCRIBED BY THE AUTHOR HERSCHEL C. LOGAN on the front free endpaper. A pristine copy to boot of the 1980 1st edition. Tight and Fine in its duotone cloth, with a handsome gilt-design of an American hand-press adorning the front panel. Octavo, illustrations by the author and a foreword by the great Western publisher Ward Ritchie. 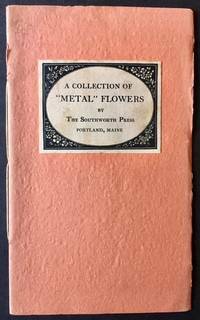 Portland, ME: The Southworth-Anthoensen Press. Original wraps. Near Fine. 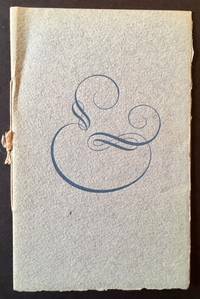 Charming meditation on the "Ampersand" by Lawrence Wroth, in the form of a miniature, 12 pg. booklet. Clean and Near Fine in its ribbon-tied wrappers, with very light creasing near the spine crown. Nicely designed and printed by the Southworth-Anthoensen Press of Portland, ME. New York: The American Friends of the Plantin-Moretus Museum, 1974. A very solid copy of the 1974 1st edition. Tight and Near Fine in a crisp, Near Fine dustjacket, with several very small closed tears along the panel edges. 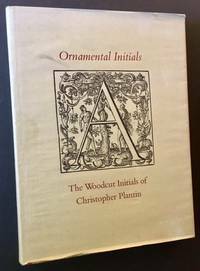 Tall quarto, the catalogue itself followed by dozens and dozens of lavish examples of Christopher Plantin's ornamental woodcut initials. Portland, ME: The Southworth Press, 1934. Original wraps. Near Fine. 1934 booklet issued by the Southworth Press of Portland. ME showcasing their collection of printer's (or "metal") flowers. Clean and Near Fine in its hand-sewn, orange wrappers. 16mo, 16 pgs. 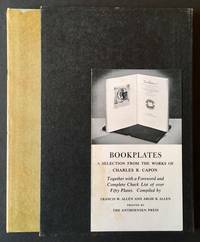 Portland, ME: The Anthoensen Press, 1950. Cloth. Near Fine/Very Good +. A handsome copy of the 1950 signed/limited. #5 of 300 copies issued AND INSCRIBED AT THE LIMITATION BY CHARLES R. CAPON. Tight and Near Fine in its light-green cloth. And in a well-preserved, VG+ example of the glassine dustjacket, with very light chipping along the panel edges and at the spine. Also includes a sturdy, Near Fine example of the publisher's dark slipcase. London: George Bell and Sons, 1901. Cloth. Very Good +. 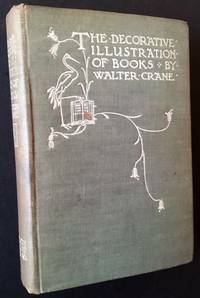 A solid copy of the 1901 1st edition. Tight and VG+ in its decorative cloth, with light offsetting at the title page (created by the original tissue-guard) and light soiling to the rear panel. 12mo, 337 pgs. Wonderful examples of European illustration thru the centuries. New York: Columbia University Press, 1932. Cloth. Near Fine. WARMLY INSCRIBED BY THE AUTHOR CHARLES RIPLEY GILLETT on the front free endpaper. A very solid copy to boot of the 1932 1st edition. Tight and Near Fine in its dark-green cloth, with just a touch of wear along the spine base. 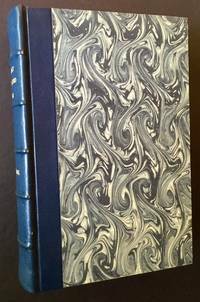 Octavo, 356 pgs. New York: Joint Distribution Committee and Committee for Chrstina German Refugees, 1938. Original wraps. Near Fine. The uncommon catalogue of this Dec. 8, 1938 non-profit auction, specifically benefitting the pre-War Christian German refugees. Chaired by the eminent Dr. A.S.W. Rosenbach and including a formidable list of donors, the catalogue contains a number of manuscript and Association copy highlights. A clean, crisp copy to boot: Solid and Near Fine in its off-white wrappers, with just a touch of offsetting along the fore-edge and at the rear panel. Octavo, Preface by Albert Einstein, the Foreword by Thomas Mann. Boston: Houghton Mifflin Co, 1923. Cloth. Near Fine/Very Good +. 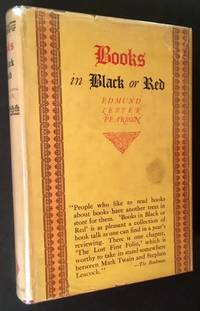 The 1923 1st edition, in the uncommon dustjacket. Clean and Near Fine in a bright, price-clipped, VG dustjacket, with very light creasing at the panel edges and light scuffing to the spine and wear along its edges. Thick octavo, 460 pgs. ALSO INCLUDES A TIPPED-IN 1 PG. TYPED NOTE ON HIS PERSONAL STATIONARY SIGNED BY HENRY HOLT. Princeton University Press, 1969. 1st. Cloth. Collectible; Very Good/Very Good. WARMLY INSCRIBED BY THE AUTHOR GEORGE GALAVARIS on the front free endpaper. A solid copy to boot of the 1969 1st edition. 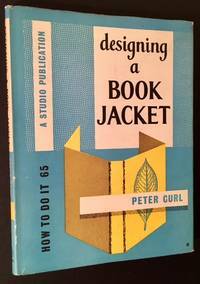 Tight and VG+ (with very light soiling along the bottom-edge) in a bright, price-clipped, VG dustjacket, with very light chipping at the spine crown and along the panel edges. A tiny bit of soiling too at the panels but still attractive and very presentable. Tall, thick quarto, 269 pgs. of text plus 112 plates. #6 in Princeton's formidable "Studies in Manuscript Illumination" series. Signed by Author. Paris: Pierre Beres Libraire Expert, 1939. Original Wraps. Collectible; Fine. Catalogue No. 22--1939. "Livres, Reliures et Autographes". Well-preserved and VG+ in its original wrappers. And in a VG example of the glassine dustjacket, with light spotting to the rear panel. Octavo, crisp black-and-white plates thruout. Greenwich, Connecticut: New York Graphic Society, 1974. 1st. Cloth. Collectible; Fine/Very Good. 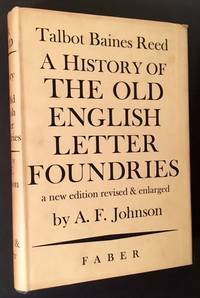 A sharp copy of the 1974 1st edition. Clean and Near Fine in a bright, price-intact, VG+ dustjacket, with very light spotting at the upper rear panel. Folio, 346 illustrations, including 8 in color and a map. Newark, NJ: Antiquarian Bookman. Original Wraps. Collectible; Very Good. The 1964 annual AB Bookman's Yearbook. Tight and VG in its printed white wrappers, with very light soiling to the panels. Octavo, 352 pgs., wonderful look at the rare book world in the mid 60s.